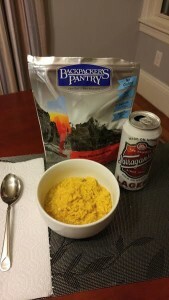 I recently got a few samples of Backpacker’s Pantry freeze-dried meals to review, and I was very excited to try them out, because Backpacker’s Pantry is one of the few large-scale freeze-dried meal producers to not just feature, but promote and develop a large variety of gluten-free and/or organic ingredient options. Backpacker’s Pantry, based out of Boulder, Colorado, offers a huge selection of meals – breakfast, lunch, dinner, dessert, snacks. Vegetarian, vegan, gluten-free, no nuts, no soy, low sodium – it’s all there. A huge selection of different meals is available for people or families with dietary restrictions, or selective diet through personal choice. I was particularly excited to try these out, because my wife is viciously gluten-intolerant. This makes life tough not only for her concerning her daily diet, but also for the guy who gets to try to stockpile and save long-term food supplies. Trying to find a variety of foods that can keep over the long haul is definitely a challenge, and I’ll take all the help I can get; so color me tickled pink to see some decent gluten-free options available. When rooting around in the box of sample meals, the first Backpacker’s Pantry meal I came upon that was gluten-free was the Persian Peach Stew With Chicken. The combination of flavors sounded interesting – definitely different – so I pulled it out of the box and read the package. The ingredient list was straightforward, with no 26-letter-long names of made-up ingredients I couldn’t pronounce, no preservatives, no “other natural flavors”. There are two servings per package, each 290 calories, with 9 grams of sugar, 12 grams of protein, 47 grams of carbohydrates, and – the Achilles heel of freeze dried food – a heavy dose of sodium at 660mg. Everything looked on the level and up to snuff, so I decided to take the meal for a test drive. Upon opening the package, you’ll find the standard-issue oxygen/moisture absorbing package, as well as a small package of organic extra virgin olive oil (a new one to me), and the dried contents of the meal. When you’re ready to whip up the meal, be sure to pull out the oxygen absorbing package out of the meal before installing the olive oil and 2 cups of boiling hot water, right in the packaging the meal comes in. Reseal the package and set aside for 13 minutes. There is a note on the package that states “rehydration time doubles every 5,000 feet of elevation gain. Our directions are set for 5,000 feet.” Since my homestead elevation is about 400 feet above sea level, I went with the standard 13 minute cook time. If you live/bug out at above 5,000 feet elevation, you’ll want to adjust the cook time accordingly, lest you have crunchy rice. Once the timer went off, I opened the package to find that the long grain white rice actually looked like rice, and all the rest of the food had nicely reconstituted from nondescript-looking chopped matter into a delectable-appearing meal. The aroma was promising as I dumped some of the contents into a bowl for its taste-bud audition. And you know what? Backpacker’s Pantry Persian Peach Stew With Chicken was surprisingly good! The peach flavor hits quickly, along with a hint of cumin. But the flavor medley plays nice with the rice and chicken, and the meal is really not bad considering 13 minutes ago it had been completely dried out and sealed in a package meant for long-term storage. Granted, it’s not homecooked, but it’s every bit as good as any off-the-shelf seasoned rice meals you can pick off the shelves at your local grocery store. The rice was a bit mushy and the small cubes of chicken were rather devoid of taste – to be expected, but all things considered, I was pleasantly impressed, especially compared to other freeze-dried meal packets I’ve tried. Perhaps the greatest compliment that I can give to the Persian Peach Stew With Chicken is that my uber-picky 16-year-old son tried the meal and approved. Normally you couldn’t get him to eat rice if his life depended on it, but he actually said that he would eat this anytime as a side dish to a main meal. He was surprised when I told him it could be considered to be survival food, and said we should keep some on hand for camping chow. My wife wasn’t available for the sampling, but I’ll make sure she tries the next gluten-free sample from Backpacker’s Pantry. Overnight gastrointestinal implications were nil – while everyone has different gastrointestinal reactions to freeze-dried foods, I did not suffer any “morning-after” races to the toilet like some preservative-sodden offerings do to me. The high sodium levels (probably combined with the tasty Narragansett Lager I had with the meal) made me a little parched the next morning, but otherwise there were no personal ugly side effects. Always a bonus, especially when toilets are a long ways from camp or the tree stand. 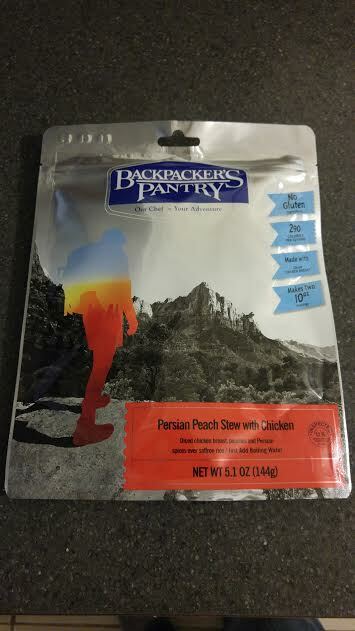 The Backpacker’s Pantry Persian Peach Stew With Chicken definitely would be a great addition to a bug-out bag, or your long-term storage plans. It isn’t available in #10 cans (yet), just 5.1 ounce freeze-dried vacuum-sealed foil packages. The food quality was very good (say 4 out of 5 stars compared to other freeze-dried foods), uniquely tasty with its peach flavor, and has good amounts of protein to help keep you moving when you’re on the trail. The one-half package serving size was acceptable, but if you’re on the move or expecting lots of sustained movement for the day, you might want to chow down on the whole package. The price tag per pouch is a touch higher than other freeze-dried offerings, but I’d rather pay a couple more bucks and know that I’m not getting lambasted with preservatives and unpronounceable ingredients. I’m looking forward to trying a couple of the other packages in the sample box; maybe the Multigrain Buttermilk Hotcakes for breakfast? Keep an eye out for further reviews of Backpacker’s Pantry products by the SHTFBlog/Survival Cache crew.